July 8, 2016 | ProgressTH Gardening may not be the first thing you think about when talking about makers and makerspaces. But there are actually a lot of really good projects out there big and small. Hackaday, for example, featured this incredible autonomous farming tractor using drone electronics to steer it back and forth from harvester to delivery truck. 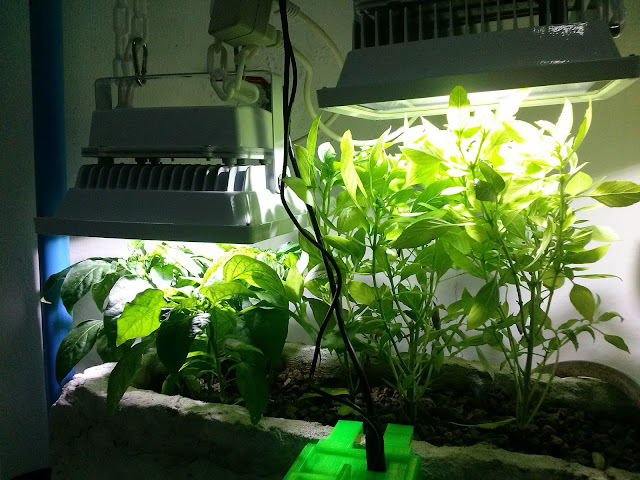 On the smaller end of the scale, you can find many automated watering systems using a moisture sensors and an Arduino (like this one on Instructables). We'd like to share with readers 3 that we are currently working on and the progress we've made so far with each. Hopefully it will give you some ideas of how to combine empty space, your empty stomach, and easily accessible technology to fill them both with. In the city, rooftops are a bit like a great desert. Especially here in Thailand, they are hot, dry, and desolate places few want to go unless the utilities usually tucked away up there break. However, with a little effort, these deserts can be turned into green oases. For our project we've tried two different kinds of grow beds. The first was made using ferrocement panels we made ourselves. Approximately one meter long and 300mm high, they are strong, relatively easy to move when needed, and resist mold, rot, heat, and rain alike. 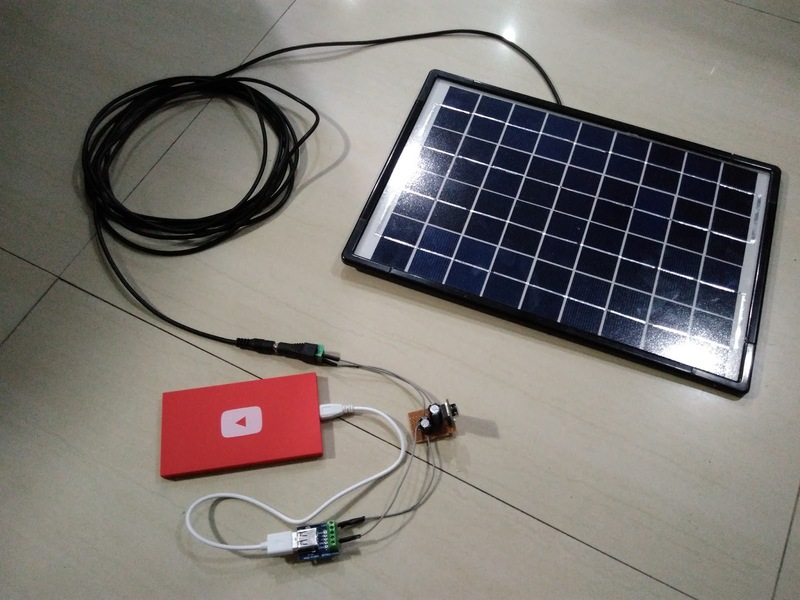 A solar panel and a DIY-5V regulator charges a cheap and readily available power bank to run Arduino projects for the rooftop garden. We also tried bamboo grow beds. Bamboo, with ordinary saws and drills can be difficult to work with. It also does not resist moisture very well and we found that it readily attracted ants. Also, because bamboo is not entirely uniform in shape and size, many gaps existed between each piece, allowing soil to wash out during watering or heavy rains. There's probably a lot of ways to solve these problems, but for our purpose we decided to go with the cement panels. 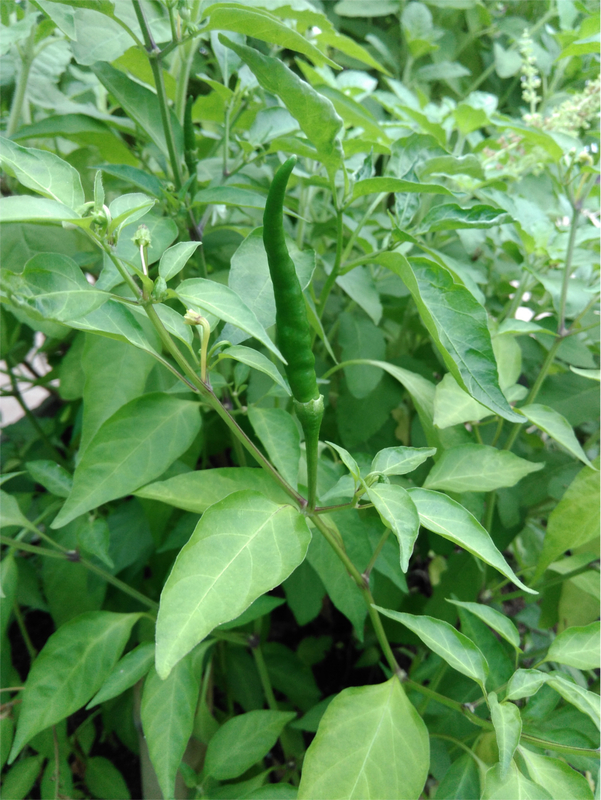 So far, we have a basic organic garden, but our goal is to automate watering as well as use sensors to gauge the general health and status of the garden remotely. In order to do this, so far we've developed a solar power supply for running an Arduino and possibly some small servo-operated valves for irrigation. We still need to develop the irrigation system as well as the sensors and a means of collecting the data. If a rooftop garden is the prefect project for city-dwellers, an automated farm is designed for a more rural setting. 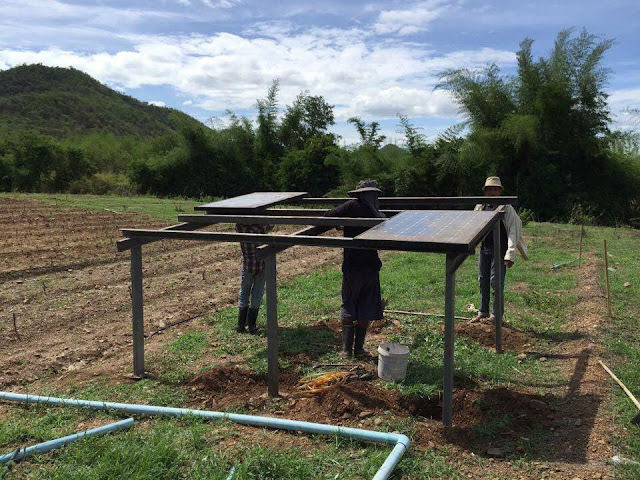 This project includes a solar powered water pump together with a timer to automate irrigation for vegetable fields. It requires a bigger investment than the rooftop garden, because larger solar panels and batteries are needed for the pumps and pipes required to irrigate a full-sized field. This project, just getting going, is being done in coordination with a local organic farming network. Several other farms already feature this same setup. Next will be actually growing vegetables on our farm. It should be made clear that this is an automated farm, not yet a "smart farm." 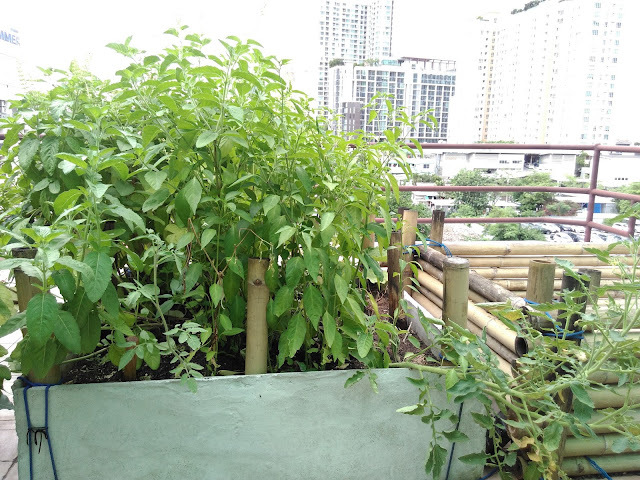 However, once we test out automation, we're going to take the system we are developing for the rooftop garden, and scale it up to make a proper smart farm. Automation is one thing, giving automation sensor feedback so it can respond to conditions in the field, as well as logging data to help spot trends and perfect the system is another. This is where the project will really require a maker's expertise. Aquaponics is the combination of keeping an aquarium and a hydroponics garden. The water from the aquarium is filtered through a grow medium, allowing plants to pull nutrients from fish waste, and return clean water to the aquarium. It can be done on many scales, big and small, as well as indoors or outdoors. 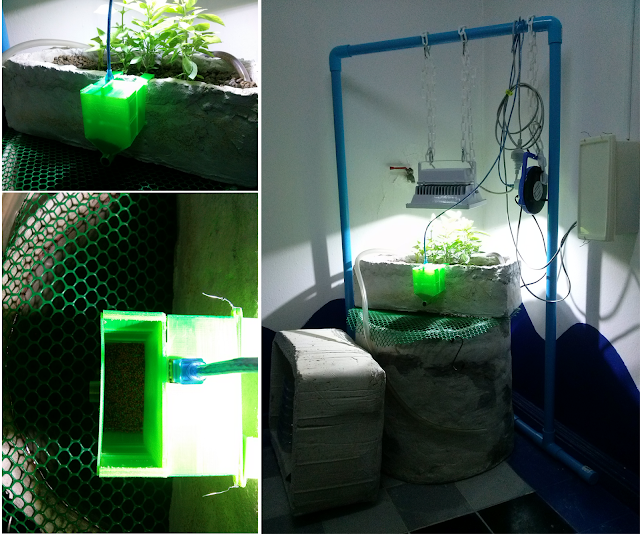 The original aquaponics project from years ago featuring our first 3D printed fish feeder. It was so good at taking care of itself, it was easy to ignore it. At 2-3 years, this is the oldest project we've been working on. With a water pump and a light and 3D printed automatic fish feeder (made when we were still Helios Labs) hooked up to a timer, it was easy to forget this project even existed, it did such a good job taking care of itself. The original snakeskin gourami used 2-3 years ago are still alive. The plants we've grown have gone from herbs, to tomatoes, and now back to herbs and possibly chili peppers. The new platform featuring a PVC pipe frame using 3D printed connectors. Still to come is an updated 3D printed fish feeder, a streaming web cam monitoring system along with other sensors for monitoring and maintaining the system. The project has also gone from indoors to outdoors to back indoors again. Currently we are looking at redesigning the 3D printed fish feeder, testing LED floodlights for viability in growing herbs and chilies, and even hooking up a streaming web cam to watch the fish remotely. It will require the use of a full range of typical maker-tech including Raspberry Pi single-board computers, Arduinos, 3D printing for cases and mounting platforms (including the rig holding the LED grow light), and sensors and relays. A lot of the work used to automate and monitor this system can be used for the rooftop garden and for the smart farm. In fact, a lot of what we've learned from this project over the last few years motivated us to tackle the other two projects. Hopefully, these projects will motivate you to get started on your own. For more details about the technical aspects of these projects, check out our project log on Hackaday.io here.